Eye of the Storm desperately needs volunteers immediately. Nina fell on the ice Sunday morning and broke her wrist. This means she can't clean stalls for a while. Please call the barn if you can help. It is coming to my attention that many lesson stables are now starting "rescues." They are finding that their unride-able, worn out school horses are no longer marketable. If they cannot be ridden, they are not being accepted at auctions. The closing of the slaughter houses and the unwanted publicity this raised caused you know what to hit the proverbial fan. Many stables just used to send to auction their unwanted horses. Many were being abandoned at the auctions when they did not sell. The auction owners don't want them either. Contrary to popular belief not all used up horses are suitable for human consumption. Though some horses end up in slaughter houses, the ride is long and the payoff is probably not worth it for most slaughter buyers unless they live close to the Canadian or Mexican border. Maybe, I hope, this is a good thing. Horses that should be responsibly cared for for life, now will be. These ones have probably taught hundreds of people to ride - we owe them! I predicted last year that the unwanted horse problem would be sorted out within two years. Little did I guess it would take this direction. All I can say is bravo! My only concern is the term "rescue." These are not "rescues." These places are stables that are now being forced to do the proper thing for these horses who have been their slaves for years. It is okay to establish themselves as non-profit, but they should be called "sanctuaries" or "retirement" facilities. None of their horses are rescues. They can still raise funds, acquire donations, etc., but these facilities are not in the trenches. They are not bringing horses back from deathly situations. They are not housing horses with emotional problems or dangerous behaviors which would condemn them to death. They are not otherwise taking in ancient horses whose beloved family members have died. They are not taking in the ones that are totally broken in mind, body, and spirit. Those of us who are, are "rescues." These others are only doing as they should. And that's okay. It's about time. Amen. But though this is as it should be - and at last honorable - these farms have their own money. They are working facilities that can and should continue the care of these horses. Most of these people own their own farms. But don't be swayed by their fancy facades. Those of us who are really and truly "rescues" actually don't have money. We depend on your support. We have been picking up the pieces of the equine industry for years. Our facilities are full of broken, throw-away horses, some of whom we have housed, cared for, and loved for years. Many of us, like Eye of the Storm, have to make due with rented facilities, never knowing if the place will be sold out from under us tomorrow. We live in constant concern of where we will get the money for our next hay delivery. We need you, we need your help for our horses, many of whom would have died years ago if they didn't come to Eye of the Storm and other rescues like ours. For example, Czardis is 28 years old. She has been with us for 10 years. She is completely broken, she is fading before our eyes. But though she is now frail and tottering she has had 10 years of love, care, rest, and good friends that she otherwise would not have had. When her day comes to join her angel we will still be here for her. We will surround her with love and we will hold her until she closes her beautiful eyes for the last time. That is what we do. To those who have been supporting us all these years I thank you from my heart. Please don't forget us - we still need you and we love you. Diamond has been placed in a family with 10 grandchildren under the age of 11. They just love him. He has found his way to a forever home. We have a new little pony. His owners had lost their home. 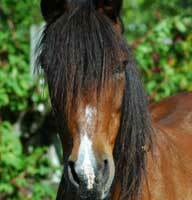 The pony needed to go within days, the family had been evicted. They also had a blind, 30+ year old mare. 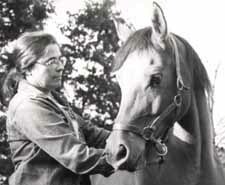 It was discussed that this mare should not be moved from her familiar home. She would be afraid and confused, and at her age would probably die soon. This would be unfair to the horse, would actually be an act of cruelty, nor fair to the ones taking her to watch her die. I made it plain that it was the owner's responsibility to provide a peaceful end for this dear old family member. She was given the last gift and was sent on her way amongst loving family members at her home. May she live again. We brought the pony to Eye of the Storm. He was supposed to be 12 hands tall, a good useful size and very possibly able to be put in a lesson program at a local facility, the owners of which I trust very much. I was sure that no more horses would come here, at least until some of our current residents passed on. The pony's name was Cocoa. He was just 10 years old, not trained to ride but kind and had been used for pony rides. All the better to be trained properly, untainted by bad training. As he stepped off the trailer I was astounded by one of the most beautiful ponies I have ever seen! He is palomino-ish, the color of a deer with a flaxen mane and tail. He looks like a little horse with a slightly bulbous nose like dear old Willie had. I was so very charmed by him. He is, in fact, under 11 hands tall, very slightly built, and a 4 year old child will outgrow him in 5 minutes. So much for the lessons program. We have, of course, all fallen in love with him. He just loves people and would be happy to move into a house to live with someone. And though he will always be Cocoa to his previous family, we already have Coco, Moon's mother, so we must call him something else. After running several names past him, none fit. We want them to tell us their real names. Sooner or later they do. Last year at this time we were working very hard to make Willie as comfortable as possible in his last days of life. Such a good boy, my dear Willie. Willie's name in his past life, we found out later, was Diamond Jim. It came to me that in memory and honor of that dear one the new pony's name is Diamond - our new little jewel. He has a tiny white spot on his forehead and with a little imagination it could be a diamond. I placed my hand on his forehead and said, "Your name is Diamond," and he said, "Yes, it is." And so we welcome our beautiful little Diamond to Eye of the Storm. 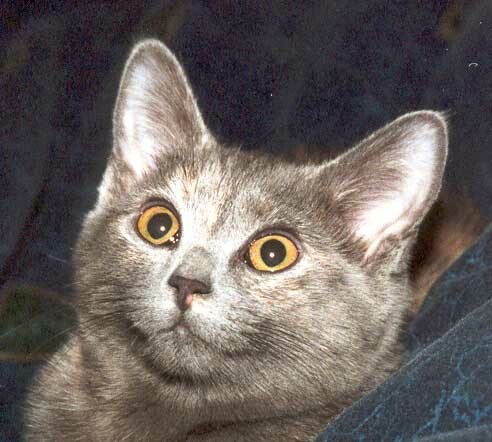 We do not endorse any of the products advertised in Ads by Google that appear on our blog. Not Pergolide or any other Cushings related "cures" or medications. Eye of the Storm produces our own herbal blend for the Cushings horse - Bess' Choice. All others are not tested, used, or endorsed by us. We have had world wide success with Bess' Choice, we would not endorse someone else's untried product. The now compounded drug Pergolide is just plain dangerous, in my opinion. So, by all means, click on them as we get a few cents when you do, but please do not assume that we agree with them. We believe our supplement is the best. Also, please note that we do not endorse other rescues except Vineyard Miniature Horse Rescue, Inc. All others I have not personally dealt with. During the month of October two of our beloved horses died. Cassie, a retired horse who spent her last days here with us had a sudden episode of congestive heart failure. She was maintained on Lasix for six more days but the damage was too great, she could not heal. She was a tough old warrior mare. In the end she died with the same fierce dignity that she had lived with. She was more than 30 years old. 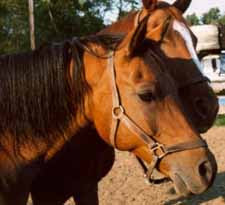 Thor, a 20 year old thoroughbred gelding, was adopted by his beloved friend, Christel, 10 years ago. She rode him almost every day and lovingly cared for him. After surgery to remove a bladder stone, he began to fade away. One day he was found in great respiratory distress. It was decided to let his beautiful horse go. He knew it, too. It was okay. May we all meet again in paradise. Eye of the Storm Equine Rescue now has a new phone number: 978-809-2090. Many thanks to everyone who supported our June fundraising house concert. We raised $3400 for the care of the horses! Harry Chalmiers sang one of Nina's favorite songs, Stay with Me, and here it is as a memento of this exciting and successful event. One of the ways people contribute to the rescued horses at Eye of the Storm Equine Rescue is by donating tack and supplies. Over the years we've accumulated quite a collection of halters, riding boots and clothes, even saddles. 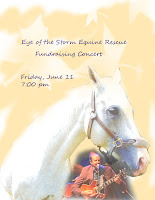 After using what's needed, Eye of the Storm offers the rest for sale to the public as a way to raise money for the upkeep and care of the horses. This year the Pegasus Tack Shop is providing a booth for Eye of the Storm to sell used tack (English and Western) on Saturday, May 22 (rain date is Sunday, May 23). Pegasus Tack Shop is located at 429 Great Road in Acton. All proceeds at the booth go to Eye of the Storm Equine Rescue, a designated 170(b)(1)(a)vi, non profit organization for the prevention of cruelty to animals, under section 501(c)(3) of the IRS code. JUNE 9 UPDATE: The fundraising event is SOLD OUT! Thank you for your support. We look forward to seeing everyone this Friday! Harry Chalmiers - guitarist, composer, and President of McNally Smith College of Music - will perform a program of acoustic guitar music and songs in the private home of an Eye of the Storm supporter. Enjoy a light hearted evening of music, wine, and appetizers with friends and horse lovers! My old Ford pickup truck needs its own truck doctor. Any mechanic out there want to help her???? She's getting kind of squashy in the front end and needs a checkup. We really rely on the old girl (named Big T for "big truck). She's tired, but still pretty awesome. This needs to be volunteer work, as the economy is tough on us too. Perhaps in exchange for the best horse poop in town for your garden? Our wild little Coco pony has turned into quite the little stall potato. Thanks to her human friend Sylvia, she now allows us to touch her all over, stands quietly for hoof trimming, and jams her face against the gate to be caught first to come in for dinner. Her naughty son Moon bugs her so much all day outside that she really appreciates getting away from him and into her own little space. Last year at this time she was dragging a rope attached to her halter because that was the only way to catch her. Now we just hold up her halter and she puts her face right into it herself! While standing in line at our wonderful, local farm stand (which is open year round), a fellow horseman working at the register commented on my boots. This happened after several days of torrential rain. I told him that after so many layers of clothing had gotten soaked through, I kept extra boots, clothing, and Xanax in strategic locations. Looking up I saw the two women standing in line behind me nodding their heads and laughing. Have you ever wondered what "night fall" really meant? As I looked at the sky one clear night I saw the deepest blackness on one side of the sky and beautiful blue on the other. As I watched I feared that some horrible storm was coming. The black slowly overtook the blue and bright stars appeared in the blackness. I just witnessed the "night falling!" Where have I been to have never noticed such a thing before? While measuring feed each night I watch the news on my little "entertainment center" at the barn. That is how I know exactly when the space shuttle would pass over on four different occasions. The human race has come a long way in the last 30 years. Modern technology is getting very scary to me! It was three years ago on January 24 that Noogie died. I have been quietly and unknowingly grieving for him all this time. As of this day, I will lock my love away for him in my heart. I will continue on and try t take better care of those still with me. Most of the horses here are just passing through, but Noogie was my son.Such a silly name for such a silly boy. The very best things in life really ARE free! 1. A 4-wheel drive pickup truck, at least good enough to pass inspection. 3. About 200 feet of outdoor 220V electric wire. 4. 200 feet of outdoor conduit tubing that can be buried. To be used with the electric wire. This is for our well pump. 5. Any kind of horse fencing. All donated items are tax-deductible. If there are any retired electricians out there with a shop full of any of this stuff and would like to give this to us we will be very grateful. One night while I was watching the weather report, they mentioned that in three minutes the town next to ours was going to be hit with a white-out. I ran outside to see it moving up the driveway! It was so amazing! As it passed over me I was completely covered with soft, powdery snowflakes. I threw back my head and faced into the wind, so soft and cool. I have never before experienced such a thing! My brother has a new girlfriend. We don't light candles at our house (I live with my brother - pretty sad, I know) for fear that my cat, Pip, could catch on fire. The girlfriend likes candles. Sure enough, Pip's tail caught on fire (he didn't even know it). So now he is banned from my brother's apartment. Being he is "just a cat" and unaware of how close he was to getting hurt, let alone burning the house down, he now pounds on my brother's door, howling his despair, "I thought you were my best bud! What did I do wrong? I love you!! Please let me in! ", until I go down (I live upstairs) to tell Pip to knock it off and that he just has to put up with my company instead. He purrs very hard, looks at me with his huge, wistful, sad eyes and allows me to carry his limp 19 pound body upstairs. I explain to him that his best bud doesn't need him anymore. He is so sad, but seems to understand. I am trying to spend more quality time with Pip at the end of the day but I am a poor substitute. P.S. After writing this, Pip is now allowed back into my brother's place, as he misses the cat, too. There are no more candles. Pay Attention!! Animals only have bodily functions to work with. They can't cuss you out, give you the finger, or slash your tires. They can only holler at you or poop on your bed to let you know that all is not right in their world. Now figure it out! The negative energy radiating out of Gabriel, our stallion, can mean: "feed me"; "my water bucket has poop in it"; "I'm cold"; "I'm hot"; "the bugs are biting me"; there's a clod of crud in my sheath"; "I have freaking ticks on my thigh next to my junk and it's bugging me"'; etc. After hours of my shouting "Shut up! What is wrong with you?" I do indeed figure it out. Gabriel says "What..are you stupid? I've been telling you this for hours." I am so used to my animals communicating with me every single day that I don't even think about it anymore. My horses really do love me, I know that, I know that I am their leader and they would follow me through fire. But they also know that I feed them, and sometimes their communication is just too loud! Thirteen horses screaming at me every time they think it's time to eat is just too much. Visitors will say, "Oh, look how much they love you! They were so quiet until you walked in!" Trust me, it's not love. They know I'm the food mama and because of that they greet me with a thunderous joyful noise! I not so joyfully thunder back, "Shut up, you selfish bunch of babies!" And they do. So most of the time, if I pay attention, I can figure out what they want, but there are many times that I am just plain stupid.